What happens when enabling Debug Logs? 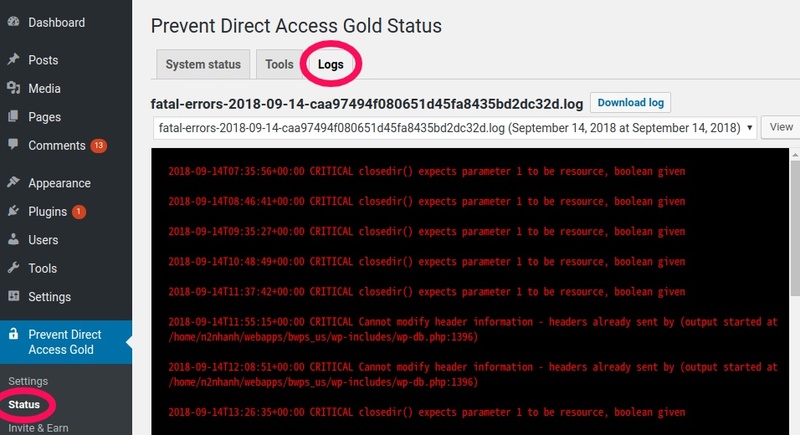 When you’re having trouble with our Prevent Direct Access Gold, “Debug Logs” could give you a hint of what might go wrong or otherwise help us speed up the troubleshooting process. When your original and/or private links don’t work as expected, there could be something wrong with your .htaccess rules (for Apache servers only). This option allows you to double-check whether our rewrite rules are inserted correctly on your .htaccess file. A unique time parameter is added at the end of all protected file URL, e.g. http://bwps.us/wp-content/uploads/_pda/2018/09/Avatar.png?t=5bb4321f1252a. This helps stop browser caching when testing its access permission. Error logs appear under PDA Gold Status/Logs. Our plugin also logs down both warning and fatal errors occurring on your website. Please attach the latest log files when contacting us for support. Please note that non-sensitive data is tracked.